This video is an in-depth guide into the Arpeggiator on the Korg MicroKorg synthesizer. 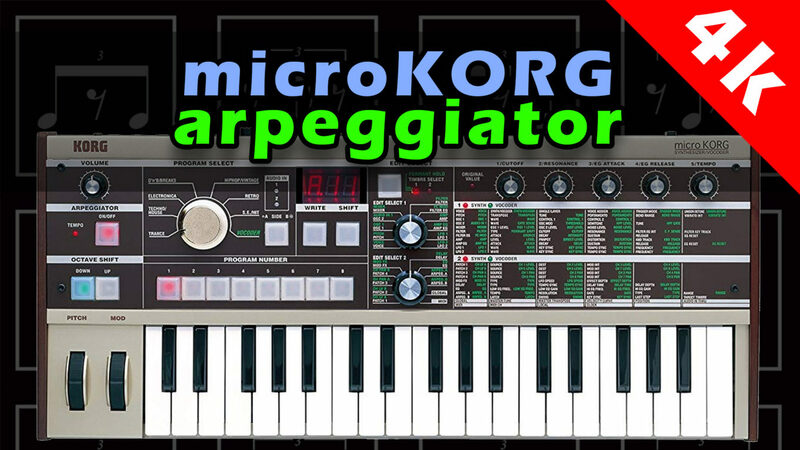 So if you’re a begginer or even a long-time use of the Microkorg – check it out because you might pick up on some cool tricks! You can access the ARP features under ARPEG.A and ARPEG.B using the Edit Select 2 knob. (Knob 1) ARPS require a tempo – and this can be set with Knob 1 (Tempo) ranges from 20 to 300. (Knob 3) Gate – specifies the duration (gate time) of the ARP notes as a percentage, with 0 being short and 100 will continue to play until the next step. (Knob 1) Latch – OFF/ON. Off = the ARP will stop playing when you take your hand off the keyboard. On – continuous play after you take your hand off the keyboard. (Knob 3) Key Sync – OFF/ON. ARP will start from beginning of pattern. When you move EDIT SELECT Knob 2 to ARPEG.A or B – the program number buttons will act as ARP step keys. Lit is “on” state for the valid steps. Off – the step will change to a rest. The best thing about the MicroKorg ARP is that it can send these notes via MIDI-OUT!